Mobile GMaps is a FREE application that displays Google Maps, Yahoo! Maps, Windows Live Local (MSN Virtual Earth) and Ask.com Maps and satellite imagery on Java J2ME-enabled mobile phones, PDAs and other devices. MGMaps can connect to a GPS receiver over bluetooth or use internal GPS features on some phones in order to automatically display the map for your current position. SalatTime computes and displays the Salat (prayer) times for muslims. It also generates months and years Salat time-tables. This is a tiny utility to discharge your battery faster. Every once in a while, you should discharge your battery completely before you charge as it helps the life of the battery. Comeks Application can be userd to create comic strips quickly using mobile phone. Created comics can be either saved, sent to your friends via MMS, e-mail or shared in www.comeks.com and in other social networks (Friendster, facebook and Bebo). Mobile GMaps now supports a closer integration with Navizon. You can use these products together on Symbian and Windows-Mobile phones to see your position on the map without a GPS device. More information on how to install both applications can be found in a previous news post. The GPS options were reorganized and the GPS position and heading can now be shown full-screen. To access the new GPS menu, select 6 in the main menu. You can also press 6 when the menu is not open to switch between the regular map screen and the GPS info screen. 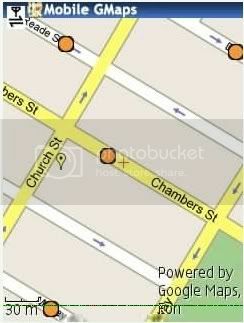 The current heading (if available) can be shown as an arrow in the center of the screen while viewing the map. A bug was fixed in the View KML service. Other minor bugs and improvements.